7" x 7" x 6"
12" x 9" x 6"
15" x 11" x 7"
The Exo Terra Rainforest Habitat Kit is the ideal set-up for the beginning herpetoculturist! The kit comes with all the components necessary to give your terrarium hobby a successful start! 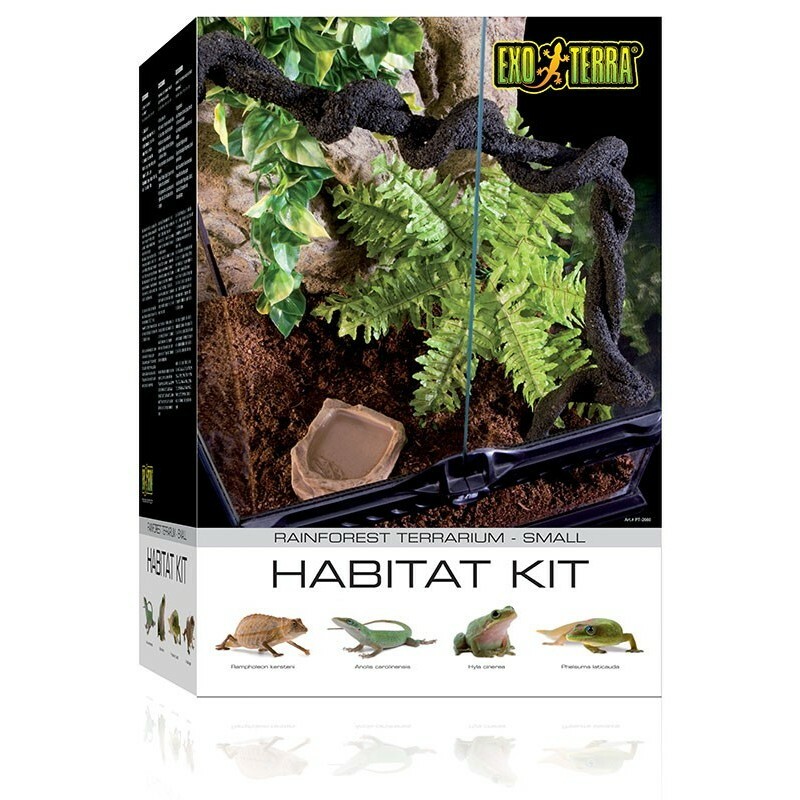 The Exo Terra Rainforest Habitat Kit is the ideal set-up for the beginning herpetoculturist! The kit comes with all the components necessary to give your terrarium hobby a successful start - including the Exo Terra Glass Terrarium, designed by European herpetologists. The Exo Terra Glass Terrarium features front opening doors, allowing easy access for maintenance and feeding. The full screen top ventilation permits the UVB rays from the compact fluorescent lighting system to penetrate deep into the terrarium. The Exo Terra Compact Top Canopy (included) was especially designed for the Exo Terra Glass Terrarium. This easy-to-install lighting system contains a fixture with reflector for the Exo Terra Repti Glo line of compact fluorescent bulbs. An Instruction Manual is included to guide you through the process of installation, decoration and maintenance of this Exo Terra Rainforest Terrarium Kit. 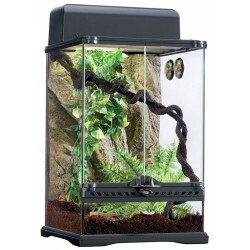 Small Habitat Kit is ideal for: Small species of snakes, frogs, lizards and geckos like Anolis carolinensis, Anolis sagrei, Rhampholeon brevicaudatus, Holaspis guentheri, Takydromus sexlineatus, Phelsuma laticauda, Hemidactylus frenatus , Lygodactylus luteopicturatus, Mabuya macularia, Sceloporus variabilis, Brookesia superciliaris, Hyla cinerea, etc. Also suitable for juvenile bigger species as a temporary housing. Medium Habitat Kit is ideal for: Small species of snakes, frogs, lizards and geckos like Phelsuma madagascariensis, Rhacodactylus ciliatus, Litoria caerulea, Agalychnis callidryas, Ptychozoon kuhlii, Uroplatus henkeli, Gekko ulikovskii, Gecko vittatus, Chamaeleo hohnelli, Chamaeleo rudis, Opheodrys aestivus, Mabuya multifasciata, Mabuya quinquetaeniata, etc. Also suitable for juvenile bigger species as a temporary housing. No customer reviews at the moment.